Here we discuss treatment strategies that are based on pharmacological interventions to reduce craving and relapse in alcohol-dependent patients. We will first provide a historical overview about relapse prevention strategies. We will then review the development of disulfiram, naltrexone, acamprosate, and nalmefene and discuss their neurobiological modes of action. Then the concept of convergent genomic analysis will be introduced for the discovery of new molecular treatment targets. Finally, we will provide convincing evidence for the use of N-methyl-D-aspartate (NMDA) receptor channel blockers as substitution drugs. 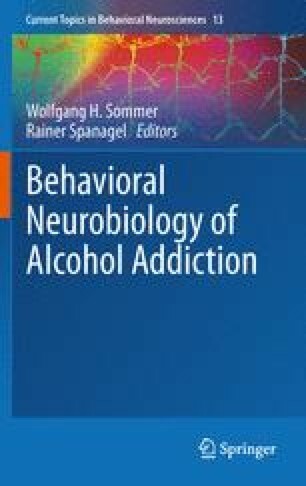 Important conclusions of this review are: (i) learning from other addictive substances is very helpful—e.g., substitution therapies as applied to opiate addiction for decades could also be translated to alcoholics, (ii) the glutamate theory of alcohol addiction provides a convincing framework for the use of NMDA receptor antagonists as substitution drugs for alcohol-dependent patients, (iii) a combination of behavioral and pharmacological therapies may be the optimal approach for future treatment strategies—one promising example concerns the pharmacological disruption of reconsolidation processes of alcohol cue memories, (iv) given that many neurotransmitter systems are affected by chronic alcohol consumption, numerous druggable targets have been identified; consequently, a “cocktail” of different compounds will further improve the treatment situation, (v) in silico psychopharmacology, such as drug repurposing will yield new medications, and finally, (vi) the whole organism has to be taken into consideration to provide the best therapy for our patients. In summary, there is no other field in psychiatric research that has, in recent years, yielded so many novel, druggable targets and innovative treatment strategies than for alcohol addiction. However, it will still be several years before the majority of the “treatment-seeking population” will benefit from those developments. This work was supported by the Bundesministerium für Bildung und Forschung (NGFN Plus; FKZ: 01GS08152, FKZ: 01GS08155 see under www.ngfn-alkohol.de and Spanagel et al. 2010; FKZ: 01GS08151) and the Deutsche Forschungsgemeinschaft (DFG): SFB636/Project B1 and D7, Reinhart-Koselleck Award SP 383/5-1, and The Deep Brain Stimulation project SP383/6-1.